Providing critical data for our democracy. Elections don't just happen in November of even-numbered years. Any given Tuesday—and plenty of other days—we vote in elections that affect local tax policy, choose school board members, fill unexpected vacancies in offices from the local to the federal, and more. Democracy Works provides comprehensive, consistent election coverage so that no voter ever has to miss an election because they didn’t know it was happening. Have you searched for your polling place or who’s on your ballot? You were using data from the Voting Information Project (VIP), a part of Democracy Works. 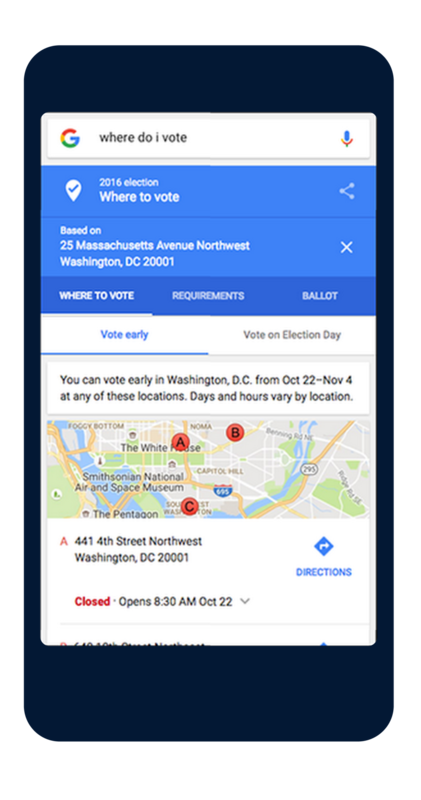 We produce the polling place and ballot data that powers everything from Google searches to the get-out-the-vote tools of most advocacy organizations. Did Facebook remind you to register or vote this year? These reminders rely on Democracy Works’s election dates and deadline data—and refer voters to TurboVote, our online registration tool. Need a user-friendly way for nonprofit organizations and election officials to get this info to their users? We're on it. We've built Get to the Polls, which allows elections officials, universities, organizations, companies, and anyone else to customize and embed an interactive tool on their own site. This tool will allow voters to find everything they need to get ready for their upcoming elections—where to vote, what will be on their ballot, and contact info for local election officials.